Today I'm inviting you to my scribal workspace. I enjoy seeing how other's work, so I thought you'd like to see mine. 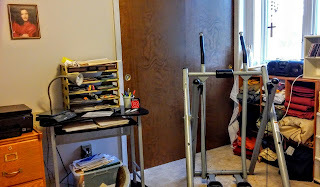 My "studio" is now half an SCA craft room. It's a few steps from a bathroom for easy access to water. It's on the same floor as the walk-out to the back yard, so I can easily let my crazy dogs in or out as they insist. My work surfaces are two 6-foot tables put together in an L-shape with a small opening at the corner for my standing floor lamp. I'm using old heavy tables I had for SCA activities before the new lighter ones appeared at stores. 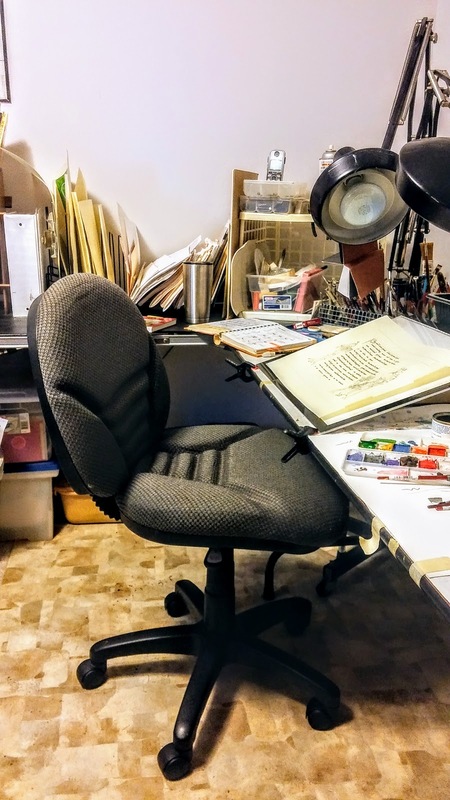 Workspace and chair, side view. Comfort is important to me, so my chair is adjustable to a height that lets my arms rest on my workspace at close to a 90° angle. It also has no armrests for me to bump against. I'm fortunate to have a large space around me, so my arms aren't cramped. Yet my chair rolls and rotates so I can easily extend my reach if something I want isn't handy. 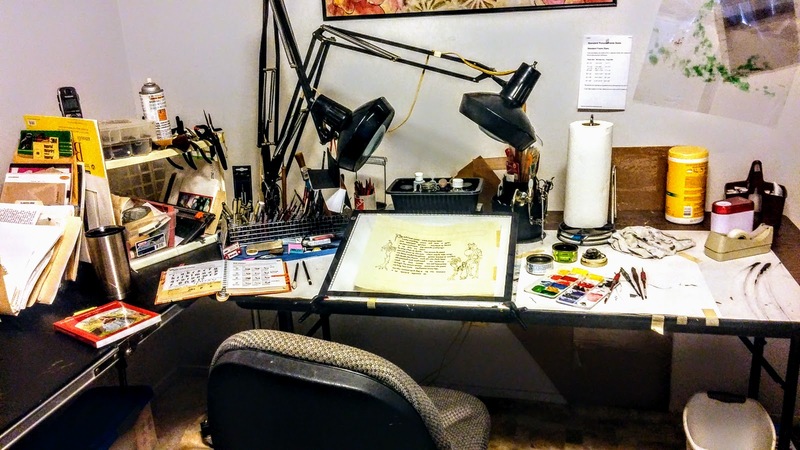 Calligraphy and illumination's detailed strokes take arm movement that let me move freely. That's important. It's even important to have a clear space at your feet so your knees aren't higher than your "bottom". My dog, Pippa, has learned to sit way to the side under the table to be near me and not in my way. Left table and corner of both. If you stand in front of my workspace and look first to the left you'll see I have a small table-top bookcase. I use it for frequently used books. Next, to its right is my initial SCA portfolio binder. 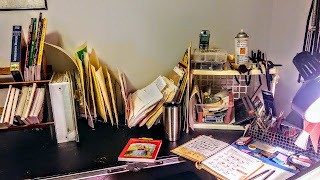 Further right is a divided support I use for sundry paper or pergamenata, folders of guide sheets and hand-outs, assorted sized mat specimens, and sandpaper packages. The top of the lattice-sided-cube holds a mobile phone, a can of workable fixative, a box of cartridge pens, and a nib box. Stuck through the lattice are several small c-clamps, strong scissors, and sometimes my draft dust brush. Inside the cube are miscellaneous items. I seem to collect a lot of them. There's a plastic shoe-box with gold leaf "pads", paper samples, and circle templates. To its right is a small Fiskars paper cutter intended for scrapbooking, which I've never done. To the table's front is room for resources such as open books, my Kindle, and online printouts. You also see my Ozark Trail covered, insulated mug. It is important because where ever I put it down, I can't accidentally stick a brush or pen in it. And limits spills. Corner with lamp protruding and lattice cube. Where the two tables meet you see the lamp protruding. To its front is my home-devised brush/pen/etc holder. Just to its front is small useful dreck: erasers, small binder clips, two sharpening stones, a shell with shell gold, a Finetec gold well etc. To its right, peaking over the light box is a colored pencil container. 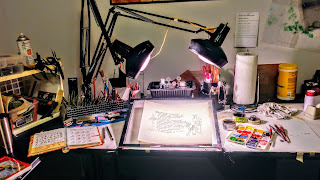 Dual swing-arm lamps(on), slanted lightbox and active work area. I am fortunate to have a dual swing-arm light system. It's a repurposed beauty salon thing. I can adjust my light to come from two directions, so I'm not concerned about direction and my head casting a shadow. Under the lamps is my light box. It rests on two thick, large books so it is slightly slanted. 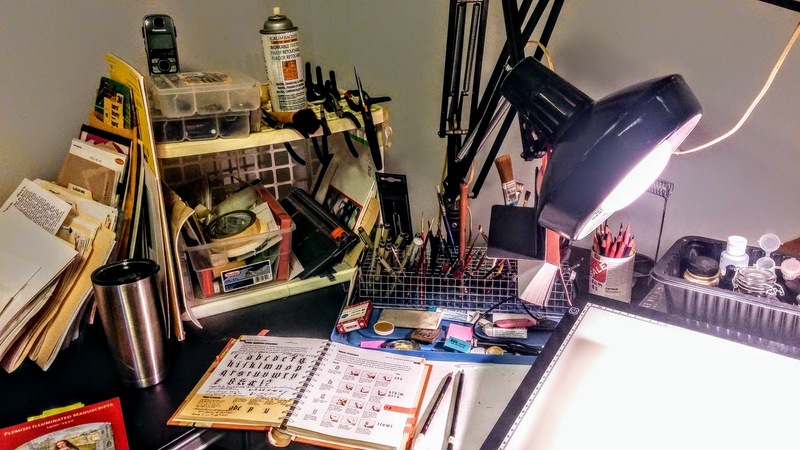 Behind it, resting on the protruding support books is a plastic container with various inks, gum Arabic, and nib cleaner. Right, active work-table broad view with lamps off. I place my inks, paints and two short water containers in a place where I don’t bump them, but I can reach them easily. 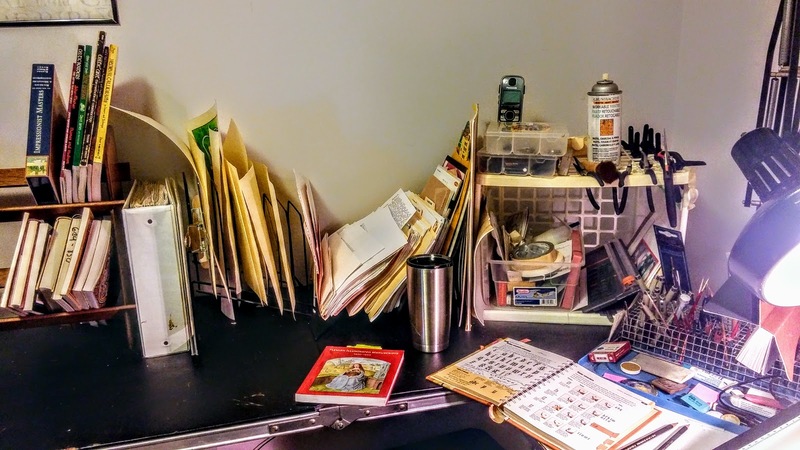 For me, that's just to the right of my slanted workspace. I also have pens and brushes. To the back, I keep a rotating utensil holder filled with rulers, a small t-square, scissors, old toothbrushes, a sharp knife and more dreck. To its right are a stand with paper towels and cleanup wipes. There's also a battery powered pencil sharpener and a tape dispenser. On the wall, I have tacked a paper with standard frame sizes and a binder clip with clear plastic sheets. I use them to protect my light box. One is also a printed transparency of my favorite size grid. Small computer station and some room view. The door to the room is immediately next, but to its right is a small computer desk, a printer, and a two drawer file cabinet. When I started doing C&I in about 1993 I would never have guessed the importance the internet would be for scribal research. It has drastically changed how I access inspirational resources. Many times, like in this picture, my laptop is on the couch in the nearby rec room, but this is available when I want it. I am lucky to have so much space. It suits my work style because I like all my tools nearby. 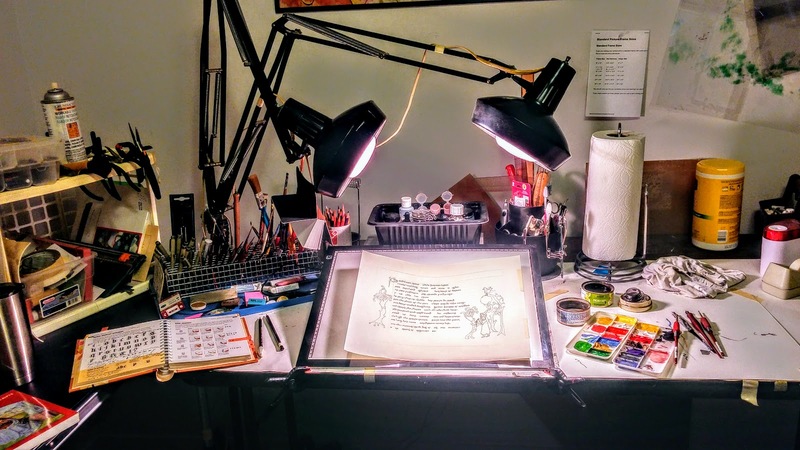 Or maybe I developed this style because I didn't have to work from a portable scribe's box. C & I doesn't need to be spread out, but I'm just spoiled by it now. Alexandre Saint Pierre's My Work Space, where he describes his apartment space.